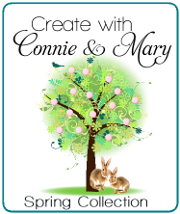 WOW…I can’t believe it…we have come to THE END of Create with Connie and Mary Spring Collection 2o14 where it was all about the Occasions Mini and Sale-a-bration Brochures. Oh my…such wonderful ideas! But you had to be a subscriber to see them. Don’t worry. If you are still looking for ideas, you can still subscribe! Check out Create with Connie and Mary NOW! On the last Saturday of the collection we do a designer only challenge and this one was a color challenge – Crushed Curry, Bermuda Bay and Basic Black. For my project this week I had used the Cook Kids set and the colors from the Kaleidoscope dsp so I had some leftover pieces ‘sitting on top of my desk’ so I put together this quick card! Whisper White – 3 1/2 x 3 1/2, run through the Arrows Embossing Folder, layer on Bermuda Bay 3 3/4 x 3 3/4 then add to the card front using dimensionals. Cut Film Strip from Basic Black and add to card front. Stamp greeting in Versamark on Crushed Curry, emboss in black and cut out using a Bubbles Framelit. Add using dimensionals. Stamp the dog in Versamark on Whisper White, emboss in black, color with Bermuda Bay marker, cut out and add using dimensionals. We have just finished Create with Connie and Mary Spring Collection 2014! But it is NOT too late to join and get GREAT ideas for products from the Occasions Mini and Sale-a-bration Brochure. You can still check out Preview Week where you can get a taste of what Create with Connie and Mary Collections are all about! 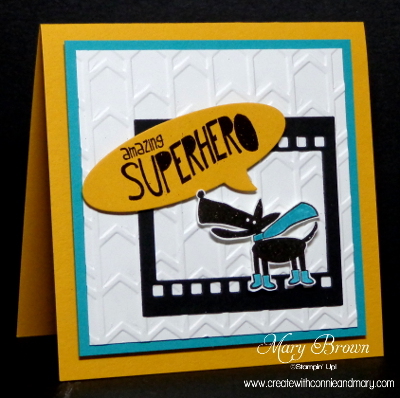 It’s another Thursday which means another FUN challenge on Create with Connie and Mary. And this week…we have a very different color challenge for you! I will have to say when I sat down to work on this challenge I really wasn’t sure what the heck I was going to do with it but I have to say, I think it turned out SOOOO cute! This set is really different but I do think it will make some cute kid cards! Smoky Slate – 3 3/4 x 5, run through the Arrows embossing folder then add to card front. Add thin strip Island Indigo 1/8 x 4 3/8 (you’ll have to trim the edges) to the card base. Cut piece of Whisper White 2 x 3 3/4 and cut top with Angled Tag Topper Punch. Stamp the dog in Island Indigo. Either color in the scarf with Perfect Plum or do like I did and stamp on a piece of Perfect Plum and cut out and add. Stamp the greeting on Perfect Plum 5/8 x 3 using Veramark and white emboss. Cut into a banner and add to the tag using dimensionals. Add Island Indigo Chevron Ribbon to the top of the tag and tie with a piece of White Baker’s Twine. 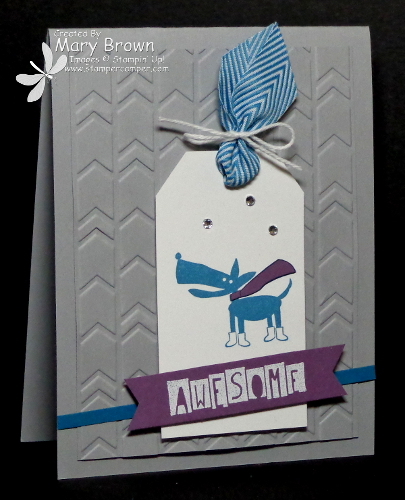 Add tag to card front using dimensionals. Add some rhinestones to the tag to finish it off.